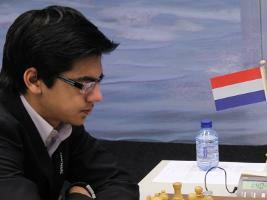 Anish Giri went for a King assault against Fabiano Caruana in a Catalan in Round 11 at the 75th Tata Steel Chess 2013. The Italian’s greed in a Catalan was punished severely by the Dutchman who could chose between many roads to victory. Black is up a pawn, but very passive and within a few moves his position becomes indefensible: 22.Nd5 Nxd5 23.Rxd5 b6 24.Bb2 a5 25.Ra4 Re8 26.Rg5 g6 27.Bd5 Kf8 28.Rf4 and without waiting for 28…Re7 29.Qc3 Caruana resigned. Replay the game with Chess King, watch the post-game video comment, and read a full round report on Chess Blog.